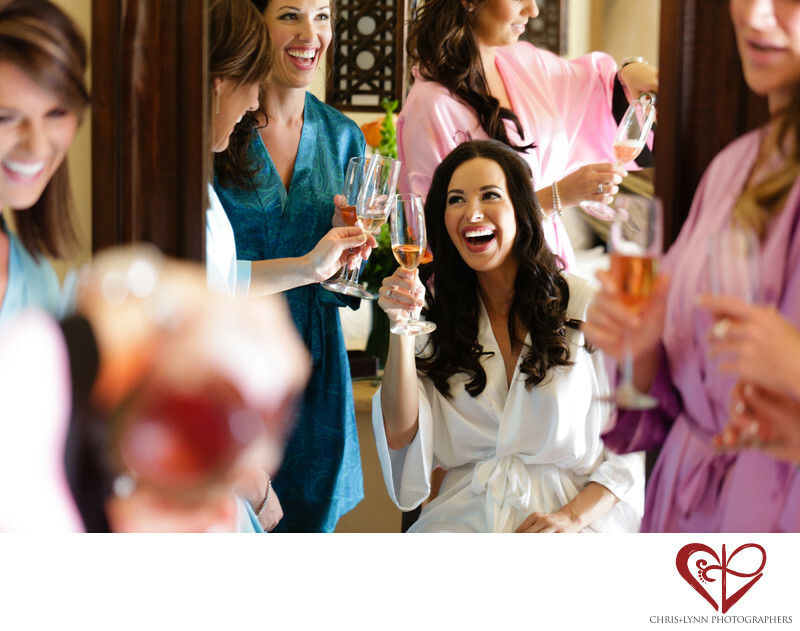 Hair & makeup is always better with jewel-colored robes and champagne! Pre-ceremony photos are a lot of fun. They give everyone a chance to get comfortable with photographers being in the room; we try to be as unobtrusive as possible and do anything we can to make people feel relaxed. We know it's hard when there are lenses pointed at you, but the best photos often happen when people act like we are not even there! This photo was shot in one of the villas at the resort. We opened all the blinds to let the natural light in and captured the bride and her bridesmaids as they reminisced and toasted each other and their friendship. I love how the bottle is visible in the foreground on the left and the bride's reflection in the mirror, but mostly I love the smiles everywhere you look in this image. I think unscripted moments like this one always evoke the feeling of the day more than posed ones. Esperanza - An Auberge Resort is one of our favorite wedding venues in all of Mexico, and we have been so fortunate to have photographed dozens of weddings there. To see a few of our favorite Esperanza weddings, please see the Featured Weddings section of the Chris+Lynn Photographers website here. 1/80; f/2.8; ISO 1000; 100.0 mm.